How are artists coping – financially, emotionally, politically – with this gloomy economic period? How are their practices reacting to its challenges? Can an intergenerational dialogue open a route into the opacity of our time? 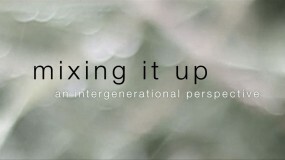 New Work Network and Artquest explored these questions through the five–film project ‘Mixing It Up – An Intergenerational Perspective’. Five short dialogues between artists from different generations give the opportunity to reflect on what it means to be an artist today and what it means to have been an artist since the late Sixties, addressing similarities and differences between contexts, modes and conditions of their respective artistic practices. The series starts with the bubbly dialogue between Ellie Harrison and Jordan McKenzie, who talked about practical ways to sustain artistic practices, followed by Robbie Lockwood and Stefan Szczelkun, who discussed the specificities of sound art and publishing. With Yoko Ishiguro and Fiona Templeton, ‘Mixing It Up’ approaches an international perspective with artiststhat work in the UK, the US and Japan. Finally, in its forth instalment, the series presents Barby Asante and Sonia Boyce talking about socially engaged practices, and ends with the relationship between art and business scrutinizedby Hunt & Darton and Richard Layzell.